Any of various hard, brittle, heat-resistant and corrosion-resistant materials made by shaping and then firing anonmetallic mineral, such as clay, at a high temperature. An object, such as earthenware, porcelain, or tile, made of ceramic. ceramics (used with a sing. verb) The art or technique of making objects of ceramic, especially from fired clay. Traditional ceramics are made from natural materials such as clay that have been hardened by heating at high temperatures (driving out water and allowing strong chemical bonds to form between the flakes of clay). 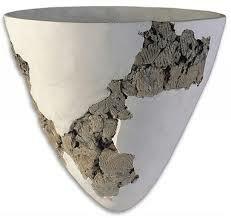 In fact, the word "ceramic" comes from the Greek keramos , whose original meaning was "burnt earth." When artists make ceramic works of art, they first mold clay, often mixed with other raw materials, into the desired shape. Special ovens called kilns are used to "fire" (heat) the shaped object until it hardens. Clay consists of a large number of very tiny flat plates, stacked together but separated by thin layers of water. The water allows the plates to cling together, but also acts as a lubricant, allowing the plates to slide past one another. As a result, clay is easily molded into shapes. High temperatures drive out water and allow bonds to form between plates, holding them in place and promoting the formation of a hard solid. Binders such as bone ash are sometimes added to the clay to promote strong bond formation, which makes the ceramic resistant to breakage. The common clay used to make flowerpots and roof tiles is usually red-orange because of the presence of iron oxides. White ceramics are made from rarer (and thus more expensive) white clays, primarily kaolin. The oldest known ceramics made by humans are figurines found in the former Czechoslovakia that are thought to date from around 27,000 B.C.E. It was determined that the figurines were made by mixing clay with bone, animal fat, earth, and bone ash (the ash that results when animal bones are heated to a high temperature), molding the mixture into a desired shape, and heating it in a domed pit. The manufacture of functional objects such as pots, dishes, and storage vessels, was developed in ancient Greece and Egypt during the period 9000 to 6000 B.C.E. Venus of Willendorf ( considered one the very first sculptures or figurines in clay) versions of this sculpture have been found all over the world. a possible fertility figure.